Mahlon DeLong and Alim Louis Benabid are honored for their roles in developing deep brain stimulation for Parkinson's disease. In a 2013 interview, Mahlon DeLong recounts the history of his work in Parkinson's. 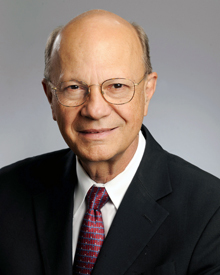 The Albert and Mary Lasker Foundation will present the 2014 Lasker-DeBakey Clinical Medical Research Award to Mahlon DeLong, MD, William Timmie Professor of Neurology at Emory University School of Medicine. DeLong will receive the award along with Alim Louis Benabid of Université Joseph Fourier, Grenoble, France. The two scientists are honored for their roles in developing deep brain stimulation of the subthalamic nucleus, a surgical technique that reduces tremor and restores motor function in patients with advanced Parkinson's disease. Their work has resulted in an effective treatment for more than 100,000 individuals worldwide with severe illness who suffer from advanced Parkinson's disease. The Lasker Awards, which are among the most respected science prizes in the world, honor visionaries whose insight and perseverance have led to dramatic advances that will prevent disease, reduce disability and diminish suffering. The Lasker Awards have championed the greatest advances in medical research for 69 years. This year's awards ceremony will take place Friday, Sept. 19 in New York City. "I join numerous other scientists and physicians at Emory University, as well as patients and families around the world who have benefited from his work, in our gratitude to Dr. DeLong and our admiration for his scientific insights, his creative genius, and his perseverance in helping resolve one of the most devastating diseases of our time," says Christian P. Larsen, dean of Emory University School of Medicine. "We are extremely proud of his accomplishments and this outstanding recognition." Parkinson's disease is a neurodegenerative disease that causes tremor, muscular rigidity, slowness of movement, and other progressive complications. Through more than 40 years of research, DeLong has played a leading role in discoveries about the functional organization of the basal ganglia, a group of connected brain structures deep in the cerebral hemispheres and their role in movement and movement disorders that have led to major breakthroughs in patient care for Parkinson's and other diseases. When DeLong began his research, in the late 1960s, scientists knew that Parkinson's disease resulted from a loss of the neurotransmitter dopamine in the basal ganglia and that replacement therapy with levodopa, the precursor of dopamine, could eliminate the symptoms. No one, however, understood how this loss caused the symptoms associated with Parkinson's or the side effects of levodopa therapy. Studying animal models of Parkinson's disease DeLong and colleagues, using microelectrode-recording techniques, identified the neuronal circuitry and abnormal cellular activity in the basal ganglia that malfunction in Parkinson's disease. They found that specific regions in the basal ganglia involved in the control of movement, including the subthalamic nucleus, exhibited abnormal and excessive cellular activity. A key finding was that inactivation of the subthalamic nucleus abolished immediately the slowness, tremor and rigidity of Parkinson's in the animal models. These findings provided a clearer understanding of the abnormalities in Parkinson's and a strong rational for surgical therapy and, thereby, contributed to the revival and development of surgical treatments for this disorder. Most importantly, they provided a highly effective surgical target, the subthalamic nucleus, laying the groundwork for treatment of the disease by high frequency deep brain stimulation, which was discovered by Alim Benabid. High frequency deep brain stimulation acts to control abnormal firing of cells through delivery of electrical impulses, much like a cardiac pacemaker. Benabid began his work with deep brain stimulation in 1987 by delivering stimulation to the brain's thalamus for essential tremor. Following DeLong's discoveries in animals about the subthalamic nucleus and its relationship to Parkinson's disease, however, Benabid began targeting that area of the brain. In 1995, he reported results from the first Parkinson's disease patients who received bilateral, high frequency stimulation of the subthalamic nucleus, and eight years later confirmed the results in an expanded study. The surgery restored motor skills, suppressed tremor, improved the ability to conduct normal activities of daily living, and allowed people to significantly reduce their medication doses and thus avoid side effects. In 2002 the U.S. Food and Drug Administration approved high-frequency stimulation of the subthalamic nucleus for treating advanced Parkinson's disease. "For nearly 70 years the Lasker Awards have honored extraordinary individuals who have made fundamental biological discoveries, developed therapies to dramatically improve patient care, and provided mentorship and leadership to pave the way for the next generation of scientists," says Claire Pomeroy, president of the Lasker Foundation. "This year's laureates join that tradition and illustrate to the public why science is so worthy of our support." DeLong is a key faculty leader of The Jean and Paul Amos Parkinson's Disease and Movement Disorders Research Program. 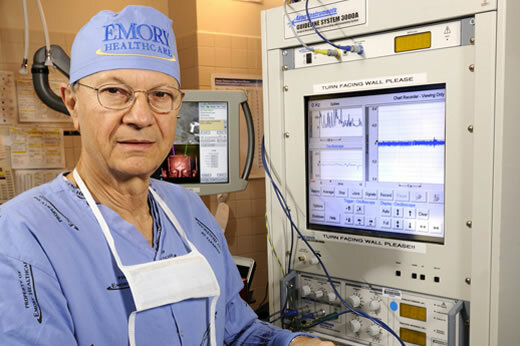 He also is co-director and founder of ENTICe (Emory Neuromodulation and Technology Innovation Center), whose goal is to foster advancement of neuromodulation and the development of innovative neuromodulation technologies for the treatment of neurological and psychiatric disorders. DeLong has received numerous awards including the 2014 Breakthrough Prize in Life Sciences, which recognizes excellence in research aimed at curing intractable diseases and extending human life. The award was given "for defining the interlocking circuits in the brain that malfunction in Parkinson's disease —laying the groundwork for treatment of the disease by deep brain stimulation." He also received the 2009 American Academy of Neurology Movement Disorders Research Award and the 2008 Movement Disorders Society Lifetime Achievement Award. He is a member of the Institute of Medicine, a fellow of the American Academy of Arts & Sciences, a fellow of the American Association for the Advancement of Science (AAAS), an elected member of the Johns Hopkins Society of Scholars, and is a past chair of the Society for Neuroscience. He is scientific director of the Dystonia Medical Research Foundation and a member of the Scientific Advisory Board of the American Parkinson Disease Association. DeLong received his undergraduate degree from Stanford University and his medical degree from Harvard University. He worked as a researcher at the National Institute of Mental Health at the National Institutes of Health (1969-1973) completed his residency at Johns Hopkins School of Medicine and was a member of the Johns Hopkins faculty (1975-1989). In 1989 he joined Emory University School of Medicine, where he served as chair of the Department of Neurology (1989-2003). For more detailed information about the awards, and about the research of Dr. DeLong and Dr. Benabid, see the Lasker Foundation website.